Finally I had some time left (no training at the moment) and took the opportunity to build a decent WhiteBox. 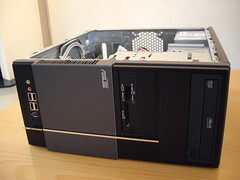 This bare bone system contains an Intel QuadCPU and 8 GB of memory and still stays under $500 USD. I’ve installed the future version of ESX and it works like a charm. The first virtual machine I created is acting as my vCenter Server and I installed it while I was cooking dinner, great performance. The next step is installing Windows 7 (64 bit), but my good old friend Mike Laverick has beat me to it. He’s already showing some really cool VMware View stuff. I’m still going to try out some of the new features anyway. Two side notes. You can use a normal network card. It doesn’t have to be an Intel® PRO/1000 PT Dual Port Server Adapter, as long as it’s an Intel PRO, the onboard Marvel adapter isn’t supported. Besides that, I’ve bought the wrong DVD-ROM. There’s little support for IDE or PATA DVD-ROM devices so you better choose a SATA DVD-ROM, otherwise the setup will crash, asking you for the install media. My list is no guarantee, maybe the final ESX release isn’t working on this configuration. Have fun with it.